Foals and Weanlings: 1 to 2 Tbsp per day. Brood Mares in the last half of pregnancy: 1 to 2 Tbsp per 400lbs of body weight two times per day. Ponies: 1 Tbsp per day. Horses in training, Stallions, Mares and Colts: 1 Tbsp per 400lbs body weight per day. DurviteTM can be provided to other farm animals including mature cattle at a rate of 1 to 3 pounds to each 1000lbs of feed consumed. Calves: 1 to 2 Tbsp per day. Poultry: 1 pound per 100 pounds of feed. Baby Pigs: 3% creep feed. 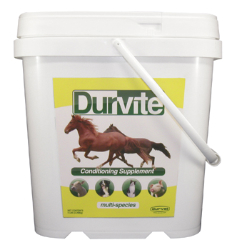 DurviteTM can be provided to dogs and cats at a rate of 1 tsp per 10lbs body weight daily. Growing pups, kittens, lactating and animals in the last half of pregnancy: 2 tsp per 10lbs body weight daily. For Mink: 1 tsp daily. The large end of the enclosed scoop measures 1 tablespoon (Tbsp)(0.385oz or 10.48g); the small end measures 1 teaspoon (tsp)(0.133oz or 3.77g).